An audio-headset factory in Tijuana, Mexico, is now home to the largest, privately owned roof-mounted solar installation in all of Latin America. The 1.16-MW system features solar panels, racking and system engineering from SolarWorld, the largest solar manufacturer in the Americas for nearly 40 years. 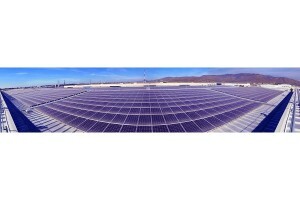 Developed and installed by 3Tek Solar, a solar integrator based in Tijuana, the system is composed of 4,284 high-performance SolarWorld solar panels. About 1.14 Mw of those panels are mounted on the factory’s industrial metal-seam roof using SolarWorld’s Sunfix Plus racking product. An additional 20 kilowatts are installed atop a covered walkway at the factory’s entrance. The system also features SMA Sunny Central inverters.